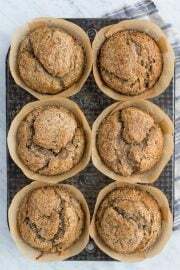 If you’re looking for a quick NYE snack recipe, this is the one for you! 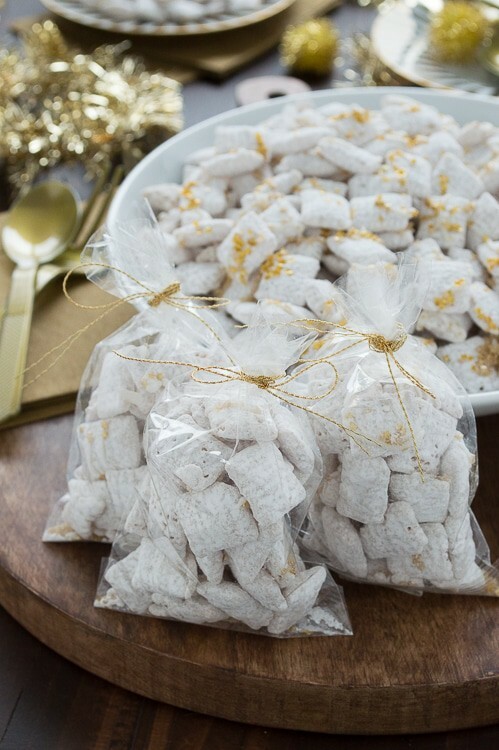 Everyone loves puppy chow, or muddy buddies, so I know it will be a hit at any party! I decided to make this batch extra New Year’s Eve-y (is that even a word?) 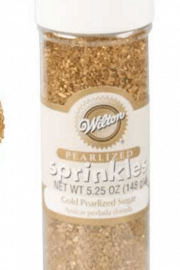 by using gold sprinkles and edible gold stars! 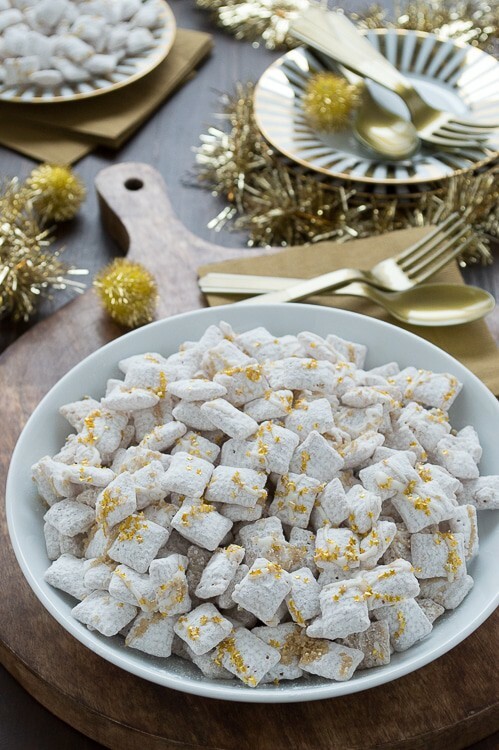 I really really like the edible gold stars in this puppy chow, that’s what makes this recipe. 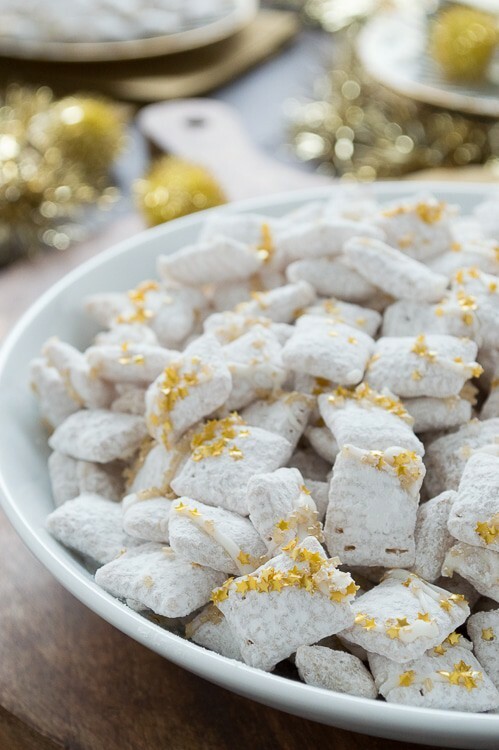 I used one entire container in making this puppy chow, and I think I could have used another container… could there ever be too many gold stars? No way, especially not for NYE! If you’re looking to order the stars, here is a link on Amazon. 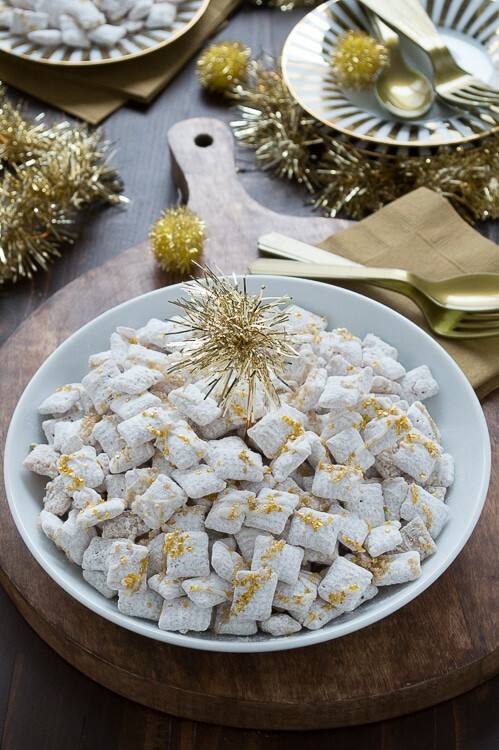 To make things a little bit more festive, put a gold tinsel topper in the serving bowl. To make the topper you will need a string of gold tinsel (here is a link to hobby lobby to see what I’m talking about) and some gold wire (see here). Measure the gold wire according to how tall your glasses are and cut it. Take a 2-3 inch piece of gold tinsel and wrap it around one end of the gold wire. My tinsel stayed without needing to be taped or glued, but you could secure with tape or hot glue if needed. Make as many as you need if you want to use them for decorating with, and I suggest that you reuse them from year to year because they are so fun! 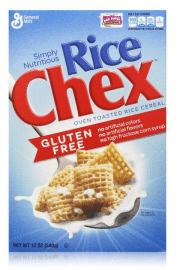 In a large bowl, place the chex cereal. Set aside. Use a knife to divide the candiquik into squares for easier melting. In a small saucepan over low heat, combine the candiquik and vegetable shortening. Stir occasionally until the chocolate is melted and smooth. Before pouring the chocolate, make sure to reserve some (about 1/4 cup) for drizzling on top of the puppy chow. Pour the chocolate on top of the chex and gently mix to evenly coat the cereal. Quickly transfer the chocolate covered cereal to a large gallon sized ziploc bag. Add in 1 cup of powdered sugar, seal and shake viciously until the cereal is coated. If the cereal is not completely coated, add another 1/2 cup powdered sugar and shake again. Pour the cereal onto a large baking sheet. Drizzle the remaining white chocolate on top of the cereal and then add the gold sprinkles and edible gold stars. I like to work in small sections when drizzling the chocolate so it doesn’t harden before I add the sprinkles. Allow the puppy chow to set on the pan for 15 minutes. 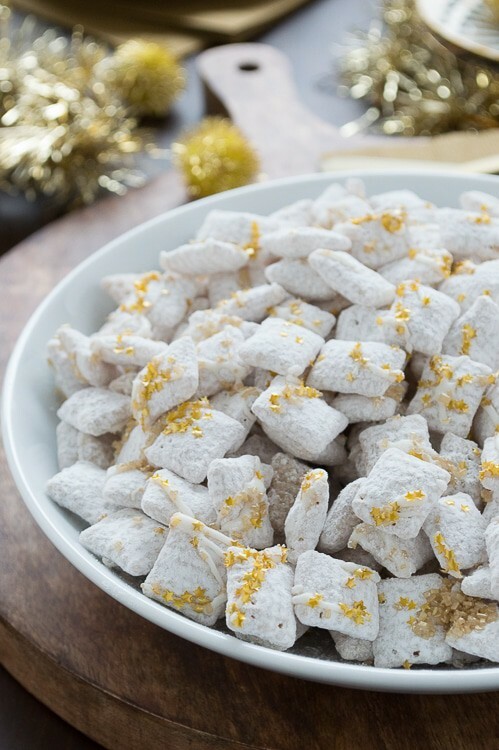 Place the puppy chow in a bowl and add additional gold stars. 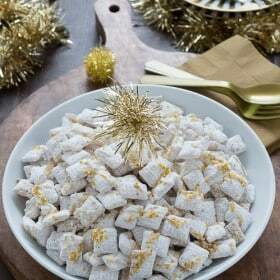 Puppy chow covered in sparkly stars just doesn’t get much better! Those edible stars are just add so much fun to this snack mix! I swear I could have used another bottle or two of those stars! Everyone does LOVE puppy chow. Never thought about doing little bags for a New Year’s Eve party. I would love if someone bag me a bag of puppy chow to take home!! 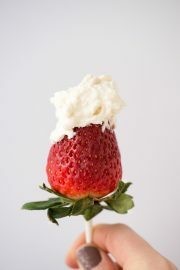 What a festive snack for the new year! I love how you packaged them up in little bags too, perfect for snacking! A little piece of NYE to take with you into the new year! Great idea! 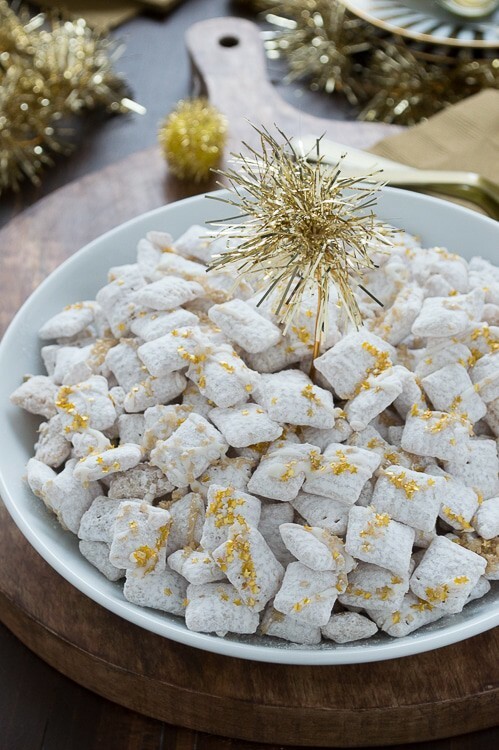 Puppy chow would make a great addition to any New Year’s Eve party. Hope you have wonderful 2015! I know I would be hoarding the puppy chow bowl at any party! You can use whatever you prefer – rice or corn! Those stars are so cute! I’ve never cared too much about New Years, but if it means I get to cover everything in edible gold stars, I’m totally in! 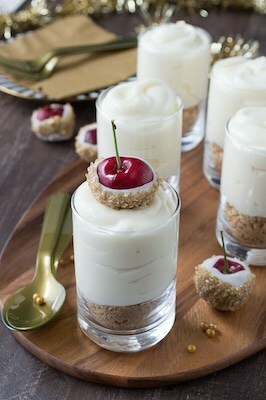 Aww I am loving all your sparkly gold recipes Beth! Totally getting me in the mood for some celebrating! I need at least another week before NYE, I have too many gold things I want to share!! 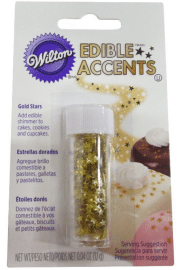 Where did you find edible gold stars?! 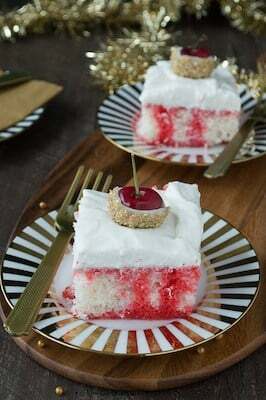 This wouldn’t make it to the party if I were to make it! Love love love! I have a gold addiction too. The gold stars are perfect! I need some of those ASAP. Happy New Year! Ali, I am so glad I’m not the only one with a gold addiction! Happy New Year to you too! Yay! 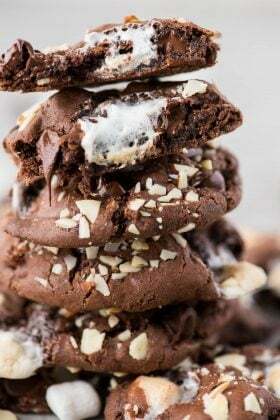 We shouldn’t not make this recipe just because NYE is over! 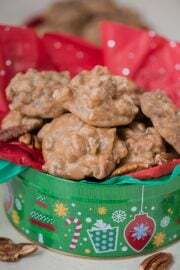 Very nice New Year Party Ideas shared on this website. I really like it and I try to implement it by my self and also tell my friends. Keep sharing more Happy new year party ideas with us so that we can make our new year memorable.